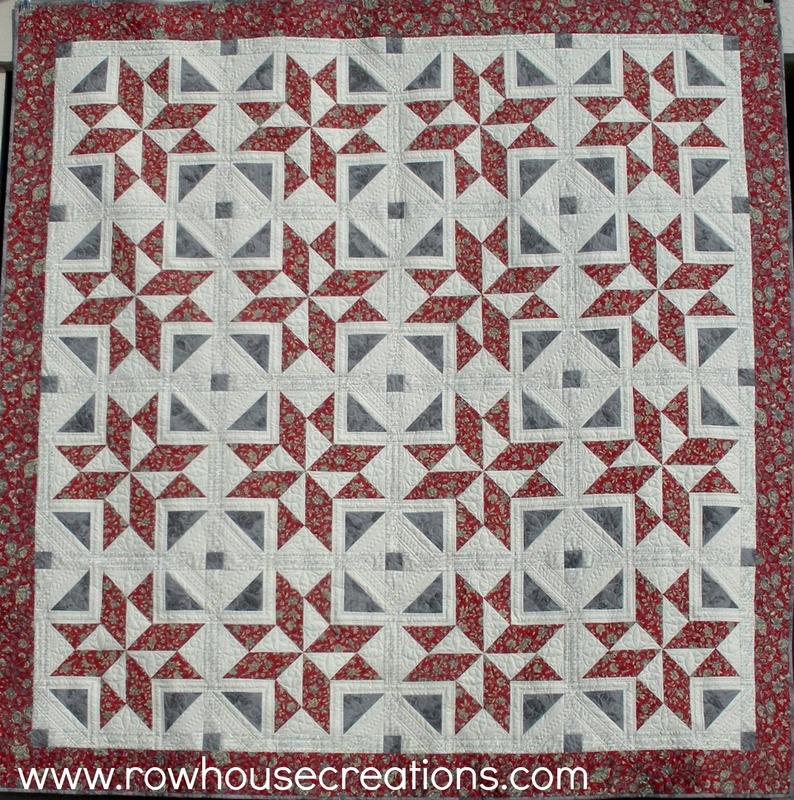 Row House Creations (my pattern company with partner, Trina Kirkvold) released our sixth pattern recently! 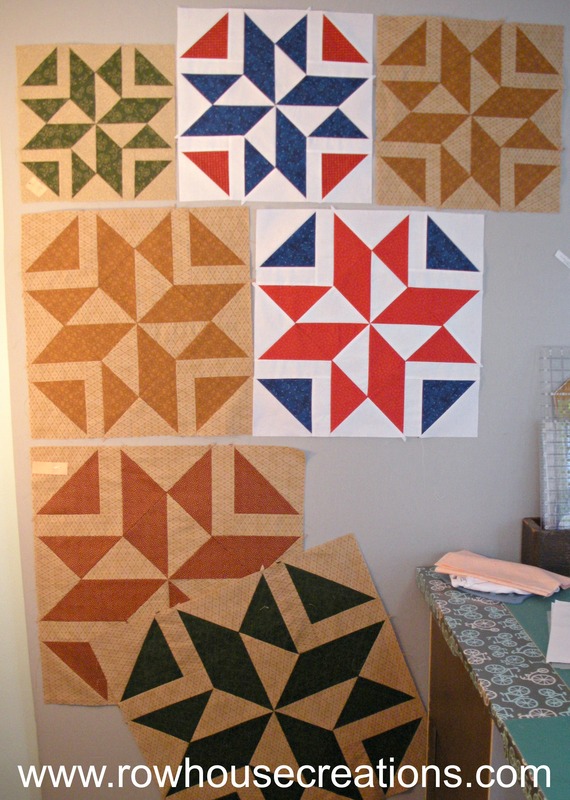 Pinafore has been a long time in the making, the cover quilt was completed in 2013. But with the shock and heartache of my husband’s diagnosis and sudden passing, this beautiful quilt was tabled for a long time. He assisted in taking the photos you see here (including outdoor pics on an EXTREMELY frigid winter day) and he came up with the pattern name (quickly and effortlessly, I might add) when we had struggled for over a week to name it. When he died so suddenly, Trina and I both struggled with going back to working on this pattern because there seemed to be so much of him tied into the project. 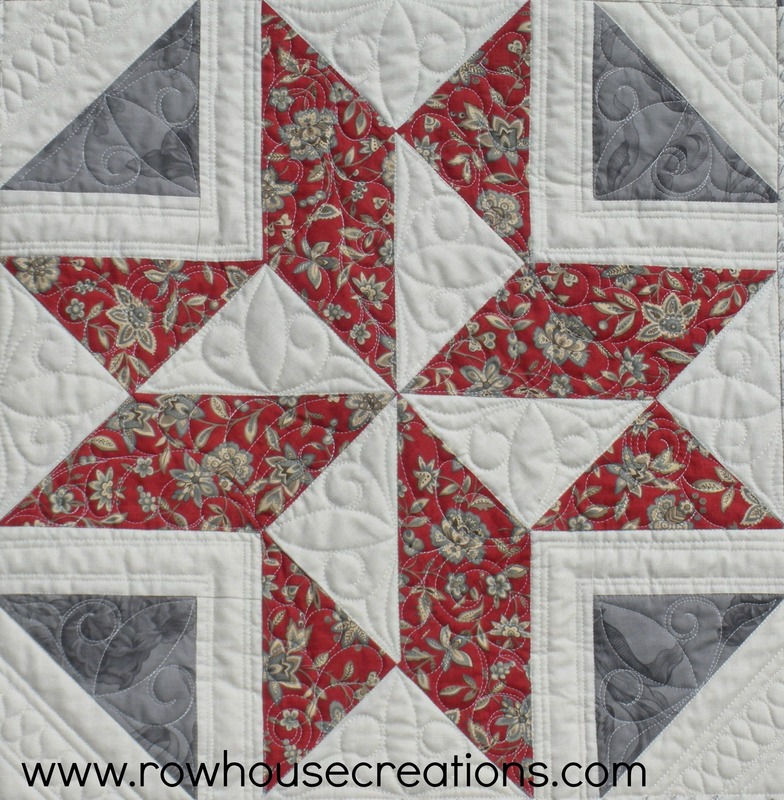 The secondary pattern created by the corner triangles and the sashing cornerstones can change the look of the quilt completely based on fabric placement… I want to try this out in a scrappy look soon. 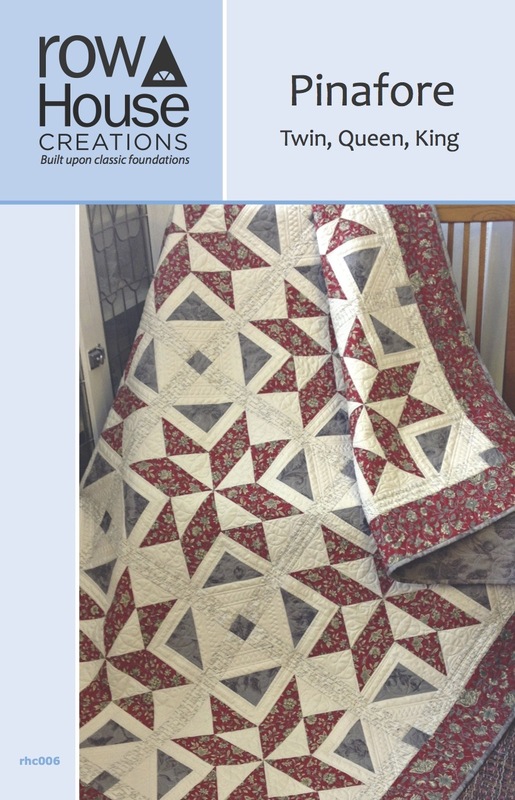 Available in PRINTED or PDF versions in our Etsy Shop, on Craftsy, Patternspot, and from your LQS (If you are in Des Moines, you can see the origianl quilt on display at Woodside Quilting and get your printed patterns at the shop). 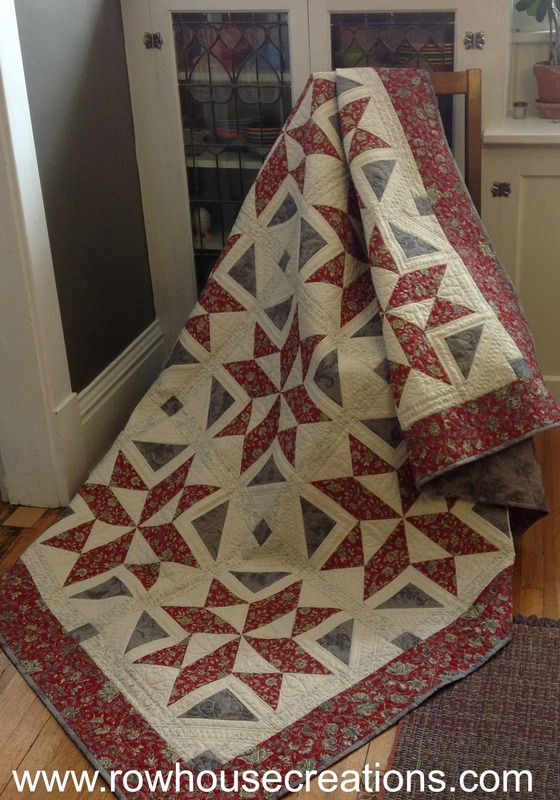 Naturally, Trina’s custom quilting makes the quilt sing! I CANNOT WAIT TO SEE YOUR PINAFORE QUILT! …and you might have noticed, pattern #7 will be Diamond Dust, which won Best Modern Quilt at AQS Des Moines, 1st Place in the MQG Riley Blake Challenge, and a Blue Ribbon at the Reiman Gardens Quilt Show in 2014. If you were at QuiltCon in Austin last week, you likely saw it on display. What a beautiful tribute! I love this quilt. I have a skirt in my closet (who knows how old?) that is almost identical to the red fabric in design and color. You girls have done a wonderful job with your designs. Always remember Frank is there looking over your shoulder with encouragement and ideas. He wants you to continue on with your dream. Thank you Kay, it’s hard to remember some days, and hard to stay motivated without that positive influence being there in the flesh.